We have some p2p internet TV clients, like TVU, SopCast, PPlive, these p2p clients can take many TV programs including foreign TV stations on your computer monitor without pay any penny. But these clients are Chinese products, can we find other p2p client for watch TV program? Today, I would like share one with everybody. 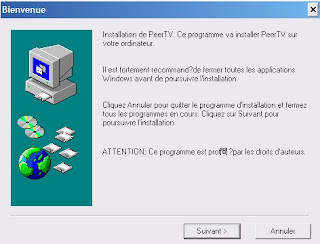 PeerTV is a French p2p client that helps you to watch internet TV program as others. Why do we have to use p2p TV client to watch internet TV program and instead of regular web TV client? I think it has two main points: one is p2p TV client is faster than regular web TV client; another reason is p2p client is stable. I use some p2p TV clients to watch some foreign TV stations, they are very stable. 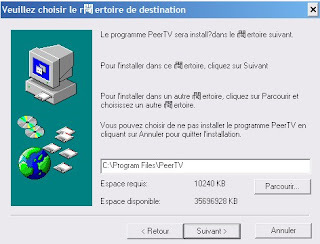 Now, let me show you how to get PeerTV. 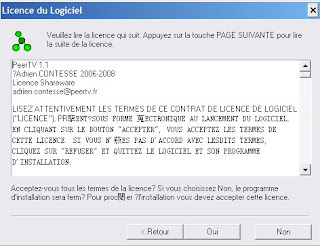 It is a French version, if you do not understand French you can look at these screenshots below. Just follow clicks "Suivant" (Next) button to end. After all done, you can start client, the interface looks like this creenshot. It is not very hard to figure out how to use it. Choose one station, double clicks it or one click "Play" icon button on bottom, it will pop-up another window, it can use your default media player to play TV program.